Nasal nitric oxide (NO) levels increase greatly during humming compared to silent exhalation. In this study, the physiological and anatomical factors that regulate NO release during humming have been characterised in 10 healthy subjects and in a model of the sinus and the nose. Single-breath humming caused a large initial peak in nasal NO output, followed by a progressive decline. The NO peak decreased in a step-wise manner during repeated consecutive humming manoeuvres but recovered completely after a silent period of 3 min. Topical nasal application of an NO synthase inhibitor reduced nasal NO by >50% but had no effect on the increase evoked by humming. Silently exhaled nasal NO measured immediately after repeated humming manoeuvres was between 5–50% lower than basal silent NO exhalation, suggesting variable continuous contribution from the sinuses to nasal NO. Among the factors known to influence normal sinus ventilation, ostium size was the most critical during humming, but humming frequency was also of importance. In conclusion, humming results in a large increase in nasal nitric oxide, which is caused by a rapid gas exchange in the paranasal sinuses. Combined nasal nitric oxide measurement with and without humming could be of use to estimate sinus ventilation and to better separate nasal mucosal nitric oxide output from sinus nitric oxide in health and disease. This study was supported by a grant from the Swedish Heart-Lung Foundation, the Swedish Research Council and by a grant from University Federico II “Progetto scambi internazionali”. Nitric oxide (NO) is released into the airway lumen 1, in particular in the upper airways 2–4. The exact origin of NO found in nasal air and the relative contribution from different sources within the nasal airways are not known. The paranasal sinuses are major sources of NO in adult healthy subjects 5 and the concentrations in a healthy sinus may be very high, ranging 5–20 parts per million (ppm) 5. The sinuses communicate with the nasal cavity through the ostia and the rate of gas exchange between these cavities is dependent on several factors, such as the size of the ostia, the volume of the sinus, the nasal airflow and intra-nasal pressure 6, 7. Proper ventilation is essential for maintenance of sinus integrity, and blockage of the ostium is a central event in the pathogenesis of sinusitis 8, 9. During normal ventilation, the time required to exchange all air in the sinuses is ∼30 min, with large inter-individual variation 7, 10. Sinus ventilation is much slower in patients with sinus disorders 10. Recently, the current authors have shown that nasal NO levels increase greatly during humming compared to normal silent nasal exhalation, probably by speeding up the sinus gas exchange, thereby increasing nasal NO output 11. In a two-compartment model of the nose and sinus the authors demonstrated that pulsating airflow, created by humming, causes a dramatic increase in gas exchange between these cavities 11. In the current study the authors wanted to further characterise nasal NO during humming, and to explore the various factors that determine gas exchange between the sinuses and the nasal cavity. Moreover, they wanted to investigate if NO measurements during humming could give additional information about the NO production at different sites in the upper airways. This was achieved by studying healthy volunteers, as well as creating a model of the sinus and the nose, where the influence on NO output by ostium size, humming frequency, sinus volume, sinus NO concentration, air flow and pressure could be investigated. The study was approved by the local ethics committee. NO output was measured in a two-compartment model resembling the nasal cavity and one sinus (fig. 1⇓). A syringe (representing the sinus) was filled with various NO gas concentrations ranging 2–10 ppm (AGA AB, Stockholm, Sweden) and connected horizontally to a plastic cylinder (representing the nasal cavity) via a luer fitting. The diameter of the syringe tip (representing the ostium) was varied between 0.8–4.0 mm. The volume of the syringe was varied between 5–20 mL. The distal end of the cylinder (nasal cavity) was left open or connected to a Hans Rudolph resistor of 50 cmH2O·L−1·s−1, thereby generating cylinder pressures of either 1 or 10 cmH2O. Flow and pressure were measured by a linear pneumotachymeter (Hans Rudolph Inc., KS, USA). Resulting NO output was measured at the distal end of the cylinder by a rapid-response chemiluminescence system (Aerocrine AB, Stockholm, Sweden). The signal output from these devices were connected to a computer-based system (Aerocrine NO system; Aerocrine AB) and yielded an instant on-screen display of flow, pressure, NO concentration and NO output. Schematic presentation of a model resembling the sinus (syringe), the ostium (syringe tip) and the nasal cavity (plastic cylinder). NO: nitric oxide. Pressurised NO‐free air was set to generate three different flow rates (0.20, 0.25 and 0.30 L·s−1). The air was led through the plastic cylinder (nasal cavity) either via a rubber duck call (Hudson & Co., London, UK), which yielded a pulsating airflow, or via a rubber duck call without the sound generating membrane (quiet control). Three duck calls with different fundamental frequencies (120, 200 and 450 Hz) were used. NO was measured during a 10‐s period and all experiments were repeated five times. In an additional experiment, a turbulent flow was generated by leading pressurised NO‐free air through a plastic mesh connected to the cylinder and NO was measured as described above. This experiment was carried out without a sound-generating device. In a separate experiment, the effect of three different humming frequencies (120, 200 and 450 Hz) on NO output from sinuses with different resonance frequencies (120 or 200 Hz) were studied. In the same model, the pulsating airflow was also generated by a subject performing oral exhalation through the cylinder, with or without phonation, at two fixed flow rates (0.20 or 0.25 L·s−1) and three different frequencies (130, 150 or 450 Hz). NO output was calculated from the entire exhalation (10 s) with subtraction of oral NO output. All experiments were repeated five times. To estimate the rate of NO exchange between the two cavities, the remaining NO concentration in the syringe at the end of each experiment was also measured. The audio signal of humming was picked up by a TCM 110 Tiepin electret condenser microphone placed on the plastic cylinder in the model (fig. 1⇑) and recorded directly onto a PC by the Soundswell Signal Workstation. The fundamental frequency was extracted by its Corr module, which computes the autocorrelation of the audio signal in two adjacent time windows. The mean fundamental frequency and sd were then determined by means of its histogram module. The resonance frequency of the model system was calculated according to Durrant and Lovrinic 12. A total of 10 healthy nonsmoking volunteers (aged 25–47 yrs, six males) without any history of allergy, nasal disease, asthma or any other chronic lung conditions were recruited. Airway NOoutput was measured with a chemiluminescence system (NIOX; Aerocrine AB) designed to meet the American Thoracic Society guidelines for exhaled NO 13. The analyser was calibrated with standard gas mixtures of NO (987 parts per billion; AGA AB). NO output was measured during oral and nasal single-breath exhalations. A tight-fitting mask covering the nose was used for nasal measurements and a mouthpiece was used for oral exhalations. The subjects started each manoeuvre by inhaling NO‐free air through the nose and then exhaled at a fixed flow rate (0.20 L·s−1) for 10 s either quietly or with nasal humming or oral phonation. The fixed flow rate was achieved by a dynamic flow restrictor in the analysing system, combined with a computerised visual feed back display of flow. The dynamic flow restrictor uses an elastic membrane valve tomechanically adjust flow rate and keep exhalation at 0.20 L·s−1 within a wide range of exhalation pressures with minimal variation. Nasal NO output during humming was calculated by subtracting the values obtained during silent oral exhalations as described earlier 14, 15. NO was calculated as the mean output (nL·min−1) during the last 80% (i.e. 8 s) of the exhalation. To investigate if humming could exhaust the source of NO, the subjects performed five consecutive humming manoeuvres with different time intervals (5 s, 1 and 3 min) between each humming. In addition, repeated silent nasal exhalations were performed at 5‐s intervals. 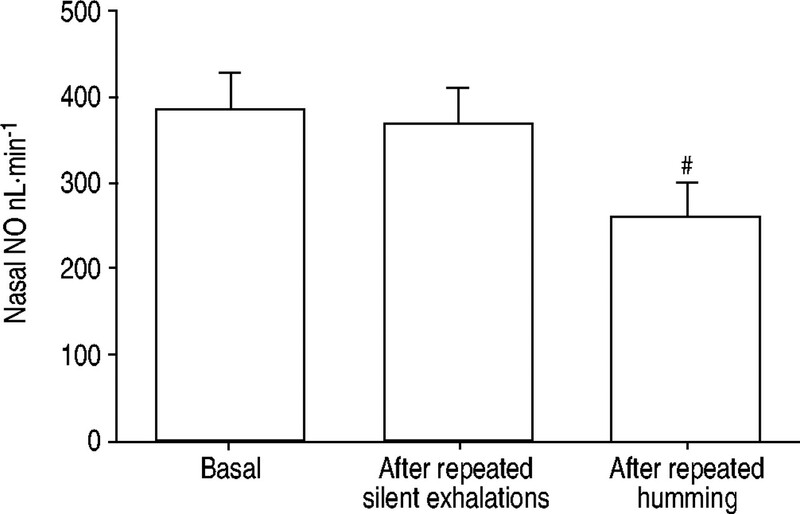 Based on the results obtained from consecutive humming manoeuvres (see below), all other humming exhalations in this study were preceded by a 3‐min period of silence. In six of the subjects, baseline nasal and oral NO measurements were performed both during humming and silent exhalations. 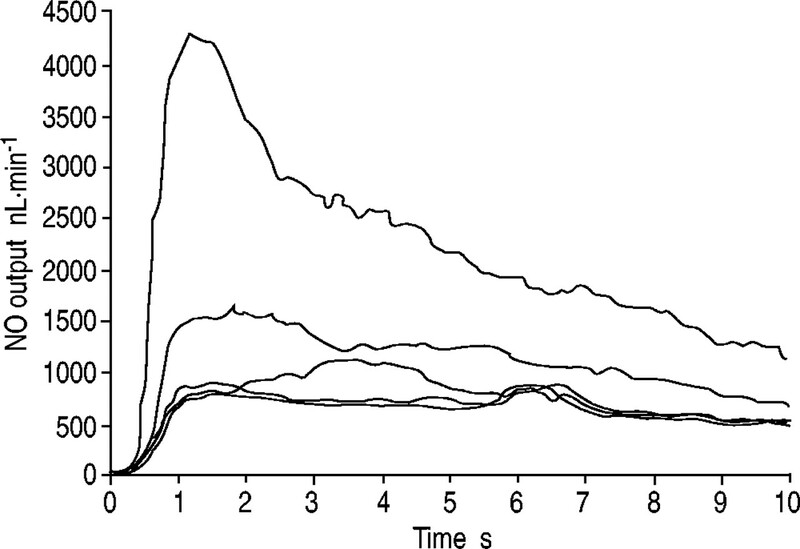 Subsequently, either a solution of NG‐l‐arginine methyl ester (l‐NAME) (Sigma, Poole, UK), 15 mg (22 mM) in 2.5 mL of saline, or saline alone was delivered through both nostrils by a jet nebuliser (Devilbiss, Somerset, PA, USA) and the NO measurements were repeated 20 min after application of the solutions. To compare the results from the model described above to the in vivo situation, additional experiments were performed in five of the subjects. The subjects were asked to exhale in turn at two fixed flow rates (0.20 and 0.25 L·s−1) against no resistance or at a resistance of 50 cm H2O·L−1·s−1 for a period of 10 s either silently or with nasal humming or oral phonation. This was followed by nasal humming manoeuvres at three different sound frequencies. Frequency was registered with the microphone taped to the neck of the subject. The NO output was calculated for all sampling modalities as flow×NO concentration. In the analysers used (Aerocrine AB) this calculation is made every 100 ms in real time during the exhalation and is expressed as nL·min−1. Nonparametric statistics with two-way p‐values were used. For analysis of paired data Friedman's test and Wilcoxon's test were used. A p<0.05 was considered significant. Results are presented as mean±sem. In all humming experiments, an initial NO peak was observed followed by a progressive decline (fig. 2⇓). Total nasal NO output increased during humming, as compared to silent exhalation (from 471±73 nL·min−1 during silent exhalation to 2,233±467 nL·min−1 during humming; p<0.001) (fig. 2⇓). Orally exhaled NO was 144±20 nL·min−1 with silent exhalation and 152±20 nL·min−1 with phonation (p=0.22). Original tracing of nitric oxide (NO) during a single-breath nasal exhalation with humming (‐‐‐‐) or silently (––). NO output measured during five single-breath humming manoeuvres with 3‐min intervals between each humming was similar, showing an intra-individual variability of <15%. With 1‐min intervals, the intra-individual variability was nearly 70%. 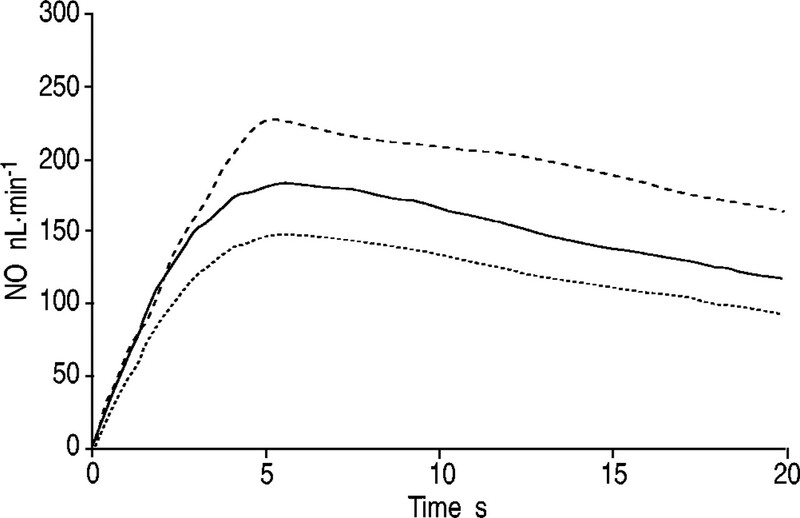 With 5‐s intervals, NO decreased progressively after each manoeuvre until a stable plateau was reached at a level of 571±88 nL·min−1, as compared to levels during the first humming of 2,233±467 nL·min−1, p=0.002 (fig. 3⇓). In all subjects the low plateau was reached within four nasal humming manoeuvres. In contrast, five consecutive silent nasal exhalations with 5‐s intervals did not affect NO output (fig. 4⇓). However, silent nasal NO output measured immediately after repeated humming manoeuvres was lower than basal silent NO output in all subjects (261±35 nL·min−1 versus 384±39 nL·min−1; p=0.021). There was a substantial variability in the reduction of silent nasal NO output after consecutive humming ranging from 5–50%. 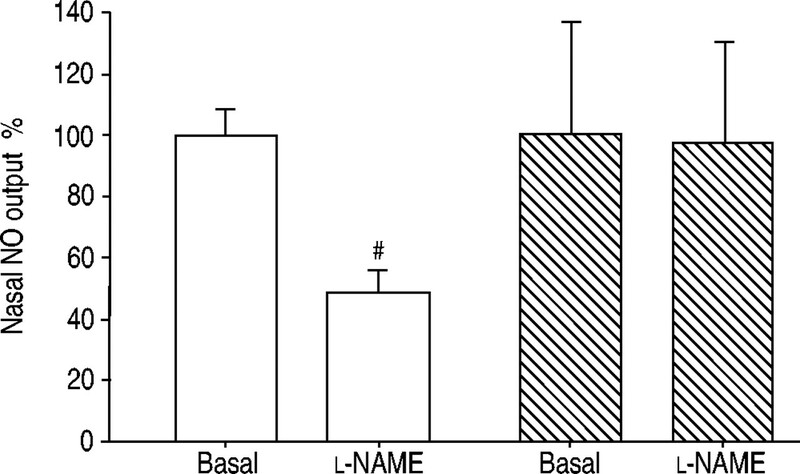 Topical application of l‐NAME reduced silently exhaled nasal NO output by >50%, from 392±33 nL·min−1 to 194±24 nL·min−1 (p=0.002; fig. 5⇓). In contrast, the humming-induced increase in NO output was not affected (2417±894 nL·min−1 before l‐NAME versus 2368±811 nL·min−1 after l‐NAME; p=0.77). Effect of repeated humming manoeuvres on nasal nitric oxide (NO) output. Five consecutive exhalations with humming were performed at 5‐s intervals. A progressive reduction in NO output was observed after each manoeuvre until a plateau was reached. Nasal nitric oxide (NO) output measured during a silent exhalation at baseline, immediately after repeated silent nasal exhalations and immediately after repeated humming manoeuvres (five consecutive 10‐s nasal exhalations with humming). #: p=0.002, as compared to baseline, n=6. Change in nasal nitric oxide (NO) output after topical nasal application of an NO synthase inhibitor (l‐NAME). The subjects exhaled either silently (□) or with humming (┘). #: p=0.002, n=6. Increasing the exhalation flow rate during humming from 0.20 to 0.25 L·s−1 resulted in higher nasal NO output (from 807±172 to 1074±197 nL·min−1; p<0.05). Change of humming frequency also affected nasal NO output. NO output was 940±77 nL·min−1 at 130 Hz, 807±77 nL·min−1 at 150 Hz and 719±58 nL·min−1 at 450 Hz (p<0.05). It increased with higher nasal pressure during humming (from 807±77 nL·min−1 at 1 cmH2O to 932±26 nL·min−1 at 10 cmH2O; p>0.05). In the standard setting of the model, a fixed flow rate of0.2 L·s−1, a NO concentration of 8 ppm, a pressure of 1 cmH2O, a syringe volume of 15 mL, an ostium size of 1.9 mm and a humming frequency of 200 Hz were used. The resonance frequency of this system was calculated to be 200 Hz. When changing one parameter in the experiments, all other values were kept constant. In all experiments using the model, artificial and human humming caused an increase in NO output compared to silent exhalation. When using artificial humming in the model, NO output increased >10‐fold from 23.7±0.1 nL·min−1 during silent airflow to 295±4.5 nL·min−1 during humming (p<0.05). When a subject was humming in the model, NO output increased from 27.7±0.1 nL·min−1 during silent exhalation to175±8 nL·min−1 (p<0.05). No difference in NO output wasseen in the model when using a turbulent flow compared to a nonturbulent flow (25.2±0.2 nL·min−1 and 23.7±0.1 nL·min−1, respectively). Ostial diameters of 0.8, 1.3, 1.9, 2.1 and4.0 mm were used. NO output during humming increased with larger ostium size (fig. 6⇓). With a ratio for the ostium size of 1:1.6:2.4:2.6:5 the ratios for NO output in the human andartificial models were 1:4.5:6:14:30 and 1:8:13:15:39, respectively. Influence of ostium size on sinus gas exchange in a sinus/nasal model. A subject performed a single breath exhalation at a fixed flow rate (0.2 L·s−1) either silently (○) or with phonation (•). Sinus gas exchange was calculated by measuring nitric oxide in the syringe before and immediately after each exhalation. 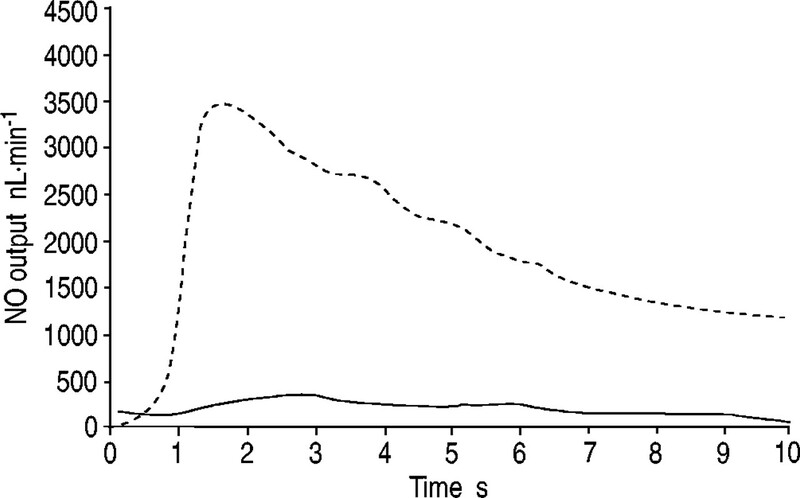 As an estimation of the rate of air exchange in the sinus, the remaining NO concentration in the syringe was measured immediately after the exhalations (fig. 6⇑). No significant changes in syringe NO concentrations were found after silent exhalations, regardless of ostium size. In contrast, during humming the NO exchange was strongly dependent on ostium size and reached almost 100% with the largest ostium (fig. 6⇑). Significant changes were found in NO output by modifying the frequency of humming in all experiments. When using artificial humming in the model, NO output was 230±5.7 nL·min−1 at a frequency of 120 Hz, 295±3.4 nL·min−1 at 200 Hz and 143±2.0 nL·min−1 at 450 Hz (p<0.05). In the human humming model, NO output was 204±11 nL·min−1 at 130 Hz, 175±8 nL·min−1 at 150 Hz and 143±2 nL·min−1 at 450 Hz (p<0.05, n=5, fig. 7⇓). The effect of three different humming frequencies (‐‐‐‐: 130 Hz; ––: 150 Hz; ······: 450 Hz) on nitric oxide (NO) output in a sinus/nasal model. A subject exhaled orally in the model at a fixed flow rate of 0.2 L·s−1, a NO concentration of 8 ppm, a resistance of 1cmH2O and an ostium size of 1.9 mm. When studying the effect of different humming frequencies on NO output from syringes with different resonance frequencies, it was found that the NO output was greatest when the humming frequency was close to the resonance frequency of the particular sinus (table 1⇓). Tables 2⇓ and 3⇓ show the result after humming when the ostial size, NO concentration, flow and resistance were kept constant according to the standard setting. Syringe volumes of 5, 10, 15 and 20 mL were used. With a ratio for the sinus volumes of 1:2:3:4 the ratios for NO output were 1:2.5:5:7 in the artificial humming model and 1:2:4:5.5 in the human humming model. Tables 2⇑ and 3⇑ show the effect of syringe NO concentration during humming. NO concentrations of 2, 4, 8 and 10 ppm were used. With a ratio for the syringe NO concentration of 1:2:4:5 the ratios for NO output in the artificial and human humming models were respectively 1:2.1:4:5.5 and 1:2:3:7. Results concerning NO output at different nasal flow rates during humming are shown in tables 2⇑ and 3⇑. With a ratio for the flow rate of 1:1.25:1.5 the ratios for NO output in the artificial and human humming models were 1:1.25:1.4 and 1:1.5:2, respectively. In the artificial humming model, an increase in NO output with higher pressure during humming (from 175±8 nL·min−1 to 377±22 nL·min−1) was found. In the human humming model, a reduction was found as the pressure was increased (from 250±3.4 nL·min−1 to 140±1.9 nL·min−1). In this study the authors have characterised the large and reproducible increase in nasal NO output caused by humming in healthy volunteers, as well as in a model of the nose and sinus. It was found that the humming method could add relevant information about the relative contribution of NO from the nose and sinus, as well as ostium patency. Several factors indicate that the NO increase seen during humming is mainly due to a rapid washout of NO accumulated in the paranasal sinuses. The profiles of the nasal exhalation curves (peak and progressive decline) in the model and in the human studies were very similar and the factors influencing NO output were identical. Both the peak and the total nasal NO output were markedly decreased following repeated consecutive humming manoeuvres but a complete recovery was observed after a 3‐min period of silence. This pattern fits well with the notion that humming empties the sinuses and that a period of silence will allow for NO to accumulate again. In addition, as shown very recently in patients with nasal polyposis and complete sinuses obstruction 16, single-breath humming was completely ineffective in producing an increase in NO output. One cannot exclude the fact that humming could increase NO output from other sources of NO in the main nasal airways. However, oral NO output did not increase during humming in this or an earlier study 11, indicating that pulsating sound waves do not increase NO diffusion from NO‐generating respiratory epithelial surfaces in general. In addition, a NO synthase inhibitor (l‐NAME) applied locally in the nose reduced silent nasal NO output by 50% but had no effect on the increase during humming. Assuming that this route of administration mostly affects the nasal mucosa with less penetration into sinuses, this argues against a major contribution from the nasal mucosa to the NO increase seen during humming. Some of the factors that may influence the rate of air exchange between the sinuses and the nose have been studied here. The model parameters were chosen because they resemble physiological values 6, 7, although it is impossible to define a normal nasal cavity and paranasal sinus since the anatomical and physiological variations are almost unlimited. The normal volume of the maxillary sinus is considered to be ∼15 mL, ranging 2–30 mL 17, and the NO concentrations in the paranasal sinuses are variable, ranging 5–>20 ppm 5. The normal diameter of the maxillary ostium is ∼2 mm but may vary between 0.5–5 mm 6. Finally, the respiratory pressure in the paranasal sinuses is similar to that in the nose when the ostia are patent and amounts to ∼1 cmH2O 6. Earlier studies have shown that ostium size is the most important factor determining sinus ventilation 6, 7, 10, 17, which is also influenced by airflow rate, airway pressure and sinus volume. In the present study all these factors affected the increase in nasal NO during humming and, again, ostium size seemed to be the most important. In addition, sinus NO concentrations and humming frequency also affected sinus ventilation. Interestingly, the humming frequency affected sinus output both in the model and in the healthy volunteers. The reason for this is not entirely clear at this stage. It is likely that the individual shape of the sinus and the nose will determine at which frequency the maximal ventilation of the sinuses will occur. Every cavity has a specific resonance frequency, which can be calculated from its shape and size. In preliminary experiments the authors have shown that the ventilation of the sinus in the model is greatest when the humming frequency is close to the resonance frequency of the sinus model. It should be considered that the model presented here does not mimic the continuous NO production occurring normally in the human sinuses 5 and the complex dynamics of production and absorption from nasal airway mucosa 18, 19. 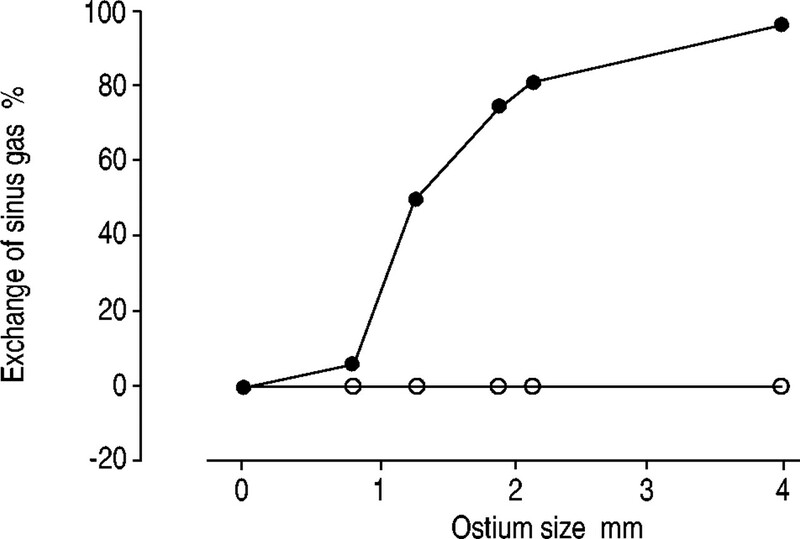 Moreover, the sinus ostium diameter could not be directly measured in the healthy subjects. Another obvious methodological problem is the fact that changes in syringe volume in the model will automatically change the resonance frequency of the system. For this reason it is somewhat difficult to separately pinpoint the importance of volume in the model used. The experiments looking at remaining NO in the syringe after single-breath exhalations indicate that humming is an enormously effective means of increasing sinus ventilation. This is also supported by the in vivo experiments, where the rapid decline in NO during humming indicated sinus emptying. Previous work has shown that the time needed to exchange all gas in the sinuses varies between ∼5 min up to 1 h 10, 17, with much longer time needed in patients with sinus disorders 10. The current results indicate that almost the entire sinus volume is exchanged in one single exhalation if the subject is humming. Even when using a small ostial diameter, humming was very effective at increasing NO exchange in the sinus model. This suggests that humming could help to increase sinus ventilation in patients with sinusitis and partly obstructed ostia. Whether this would be beneficial in treatment or prevention of sinusitis remains to be studied. Nevertheless, it is interesting that medical, as well as surgical, treatment of chronic sinusitis generally aims to increase sinus ventilation, which is often impaired in this disorder. There has been much discussion on the anatomical origin of nasal NO. A great deal of NO is produced in the sinuses 5, but the contribution of sinus NO to that found in the nasal cavity is somewhat unclear. Some authors have claimed that sinus NO is the major source of nasal NO 5, 20, 21, while others believe the contribution from the sinuses is of minor importance 22. In the present study, silent nasal NO output was between 5–50% lower immediately after repeated humming. If the assumption is made that the sinuses are effectively emptied by this manoeuvre, the decrease should fairly well reflect the normal contribution from the sinuses toNO found in nasally exhaled air. It is, however, important to note that this assumption may only be true under theexactconditions of this study. For example, at a different flow rate the relative contribution from the sinuses andnose may differ and the sinus contribution seems to be larger during inhalation compared to exhalation 23. Nevertheless, using the methods described here, it may be possible to better separate sinus NO from nasal mucosal NO release. Thus, the large peak seen during humming is probably predominantly of a sinus origin whereas the nasal mucosa contributes relatively more during silent nasal exhalations. Measurements of nasal NO could be useful in the clinic in diagnosis and therapy monitoring of respiratory disorders. For example, nasal NO is extremely low in primary ciliary dyskinesia (PCD) 4 and in cystic fibrosis 24. In fact, a nasal NO test is currently part of the clinical routine at the national centre for PCD in the UK 25. In allergic rhinitis the picture is less clear. Some groups have shown an increase in nasal NO in rhinitis 26–28, while others find normal values in these patients 24, 29, 30. The reason for the discrepancies in studies on rhinitis is probably related to methodology. In addition, the high background levels of NO in the nose could easily blunt subtle alterations in NO production. By combined nasal NO measurements with or without humming it may be possible to better estimate NO output from the nasal mucosa, e.g. in rhinitis. A suggested method could be to start with repeated humming manoeuvres to empty the sinuses, immediately followed by a silent nasal exhalation along with NO measurements. In this way the sinus contribution to nasally exhaled NO could be minimised, which could help to unmask changes in nasal mucosal NO output. Another possible way of using the humming test would be in estimating sinus ostial patency, as suggested recently 11. Blockage of the ostium is a key event in the pathogenesis of sinusitis 6, 8, 9, 31, 32 and an easy test that could reveal this could be useful in the clinic. In the current study it was found that the ostium size was a major determinant of the NO increase seen during humming. Indeed, in the model, a five-fold increase in ostium diameter corresponded to a 30‐fold increase in NO output during humming. In further support of this, the present authors recently showed that the humming-induced increase in nasal NO output is completely absent in patients with nasal polyposis and obstructed sinus ostia 16. The exact procedure to be used in NO measurements for estimation of ostial size in vivo remains to be explored. In a future attempt to standardise these measurements, factors such as exhalation flow rate, humming frequency and effects of repeated exhalations need to be taken into account. In addition, it needs to be established whether a person should keep the nasal cavity completely nonventilated using a noseclip prior to the exhalation. In conclusion, single-breath humming causes a great and reproducible increase in nasal nitric oxide output in healthy subjects. This increase is dependent on factors that modify sinus ventilation, where sinus ostium size is the most significant. Combined nasal nitric oxide measurement with or without humming may be a useful noninvasive tool in exploring sinus ventilation as well as nasal mucosal nitric oxide output. Gerlach H, Rossiant R, Pappert D, Knorr M, Falke KJ. Auto-inhalation of nitric oxide after endogenous synthesis in the nasopharynx. Lancet 1994;343:518–519. Lundberg JO, Weitzberg E, Nordvall SL, Kuylenstierna R, Lundberg JM, Alving K. Primarily nasal origin of exhaled nitric oxide and absence in Kartagener's syndrome. Eur Respir J 1994;7:1501–1504. Aust R, Drettner B. The functional size of the human maxillary ostium in vivo. Acta Otolaryngol 1975;78:432–435. Paulsson B, Dolata J, Lindberg S, Ohlin P. Factors influencing 133‐xenon washout in a nose-sinus model. Clin Physiol 2001;21:246–252. Kaliner MA, Osguthorpe JD, Fireman P, et al. Sinusitis: bench to bedside: current findings, future directions. J Allergy Clin Immunol 1997;99:S829–S848. Wagenmann M, Naclerio RM. Anatomic and physiologic considerations in sinusitis. J Allergy Clin Immunol 1992;90:419–423. Paulsson B, Dolata J, Larsson I, Ohlin P, Lindberg S. Paranasal sinus ventilation in healthy subjects and in patients with sinus disease evaluated with the 133‐xenon washout technique. Ann Otol Rhinol Laryngol 2001;110:667–674. Weitzberg E, Lundberg JO. Humming greatly increases nasal nitric oxide. Am J Crit Care Med 2002;166:144–145. Durrant JD, Lovrinic JH. Bases of Hearing Science, 3rd EdWilliams and Wilkins, Baltimore, 1995;: p. 60. American Thoracic Society. Recommendations for standardized procedures for the online and offline measurement of exhaled lower respiratory nitric oxide and nasal nitric oxide in adults and children. Am J Respir Crit Care Med 1999;160:2104–2117. Lundberg JO, Weitzberg E. Nasal nitric oxide in man. Thorax 1999;54:947–952. Palm JP, Graf P, Lundberg JO, Alving K. Characterization of exhaled nitric oxide: introducing a new reproducible method for nasal nitric oxide measurement. Eur Respir J 2000;16:236–241. Lundberg JO, Maniscalco M, Sofia M, Lundblad L, Weitzberg E. Humming, nitric oxide and paranasal sinus obstruction. JAMA 2003;289:302–303. Aust R, Drettner B. Experimental studies of the gas exchange through the ostium of the maxillary sinus. Upsala J Med Sci 1974;79:177–186. Chambers DC, Carpenter DA, Ayres JG. Exchange dynamics of nitric oxide in the human nose. J Appl Physiol 2001;91:1924–1930. DuBois AB, Douglas JS, Stitt JT, Mohsenin V. Production and absorption of nitric oxide gas in the nose. J Appl Physiol 1998;84:1217–1224. Haight JS, Djupesland PG, Qjan W, et al. Does nasal nitric oxide come from the sinuses?. J Otolaryngol 1999;28:197–204. Tornberg DC, Marteus H, Schedin U, Alving K, Lundberg JO, Weitzberg E. Nasal and oral contribution to inhaled and exhaled nitric oxide: a study in tracheotomized patients. Eur Respir J 2002;19:859–864. Lundberg JO, Nordvall SL, Weitzberg E, Kollberg H, Alving K. Exhaled nitric oxide in paediatric asthma and cystic fibrosis. Arch Dis Child 1996;75:323–326. Arnal JF, Didier A, Rami J, et al. Nasal nitric oxide is increased in allergic rhinitis. Clin Exp Allergy 1996;27:358–362. Martin U, Briden K, Devoy M, Howarth P. Increased levels of exhaled nitric oxide during nasal and oral breathing in subjects with seasonal rhinitis. J Allergy Clin Immunol 1996;97:768–772. Maniscalco M, Sofia M, Carratu L, Higenbottam T. Effect of nitric oxide inhibition on nasal airway resistance after nasal allergen challange in allergic rhinitis. Eur J Clin Invest 2001;31:462–466. Hamilos DL. Chronic sinusitis. J Allergy Clin Immunol 2000;106:213–227. Senior BA, Kennedy DW. Management of sinusitis in the asthmatic patient. Ann Allergy Asthma Immunol 1996;77:6–19.